Playing games, especially with other people in a situation of friendly competition, is a great way of boosting motivation. 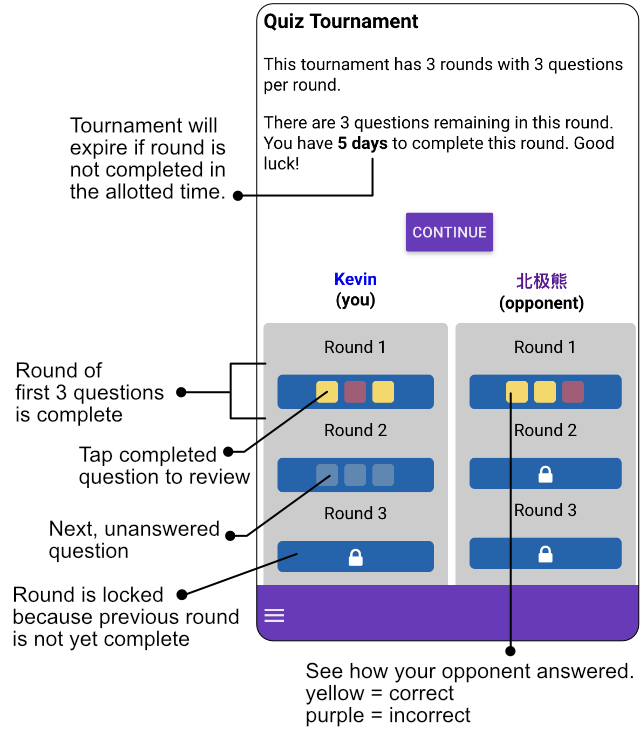 I’ve wanted to find a way to provide this for Chinese learners for a while and now Kevin and I have created a first version of a Chinese quiz tournament over at WordSwing. It’s free, but you need an account to participate. If you want to try it directly, click here. If you want to know more about the quiz tournaments, then the rest of this post will introduce them in more detail! A quiz tournament is a few rounds of short, multiple-choice reading comprehension questions. We might expand this to other areas, such as listening, culture and Chinese language trivia, but at the moment, we’re trying it out with simple reading comprehension. Each question is a race against the clock. You and your opponent will each be asked the same set of questions and you are tasked with trying to answer each question before the clock runs out. After you respond to each question you can study the content at your leisure before moving on to the next question. 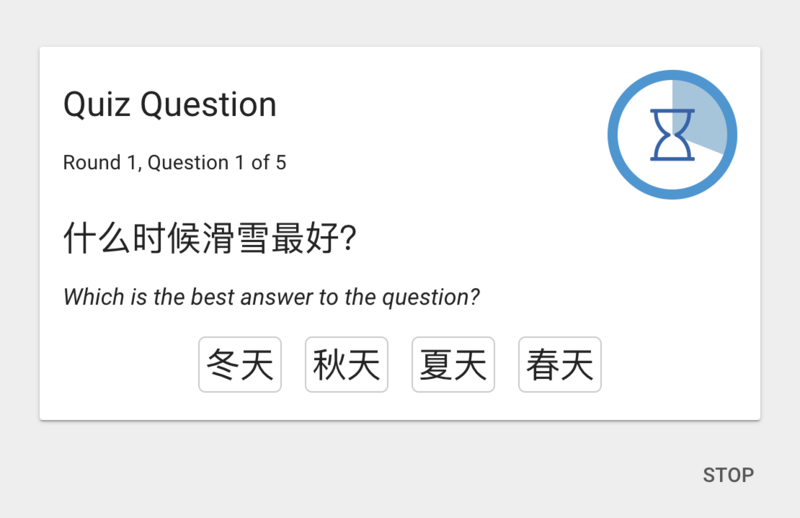 For each question, your task is to read the Chinese sentence and select the best answer among the four or five choices given. Only one answer is correct. The timer at the right shows how much time you have left to answer. At present, there are only a couple hundred questions, and so as you play, you’ll start to see some questions a second or third time. So even if these questions are quite challenging given your current Chinese level, with some playing, you’ll soon be able to get many answers correct. Having tournaments structured into asynchronous rounds, with the full tournament lasting several days gets you to practice a little bit each day. That it’s a competition against a real human changes your ability/willingness to focus and pay attention, which may improve learning. By playing opponents of varying ability, you’re reminded that there are people both ahead and behind you in the learning journey. That you don’t have immediate access to the built-in dictionary helps you be more aware of what you do and don’t know. The most important reason might be a combination of all of these that turns what could have been boring reading comprehension questions into a fun game. Your progress is shown on the left, while your opponent’s progress is shown on the right. Each subsequent round becomes unlocked when both you and your opponent have completed the previous round. You will have two days to complete each round. If you fail to complete a round in that time, then the tournament will expire, and you will forfeit the win to your opponent. Quiz tournaments are asynchronous, meaning that you and your opponent can answer the questions at different times, whenever is convenient. If you choose “Random opponent” then you will be automatically matched with an opponent and the sizing of the tournament will also be automatically determined. In practice, the random opponent will just be the next person to also select “Random opponent” a student who has just done so and is awaiting an opponent. 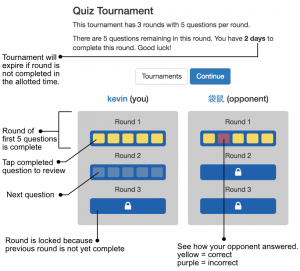 If you choose to build a new tournament, you will be able to select how many rounds you want and how many questions per round. Invite someone you know by email. Select an existing student from WordSwing. Start over and choose a random opponent. 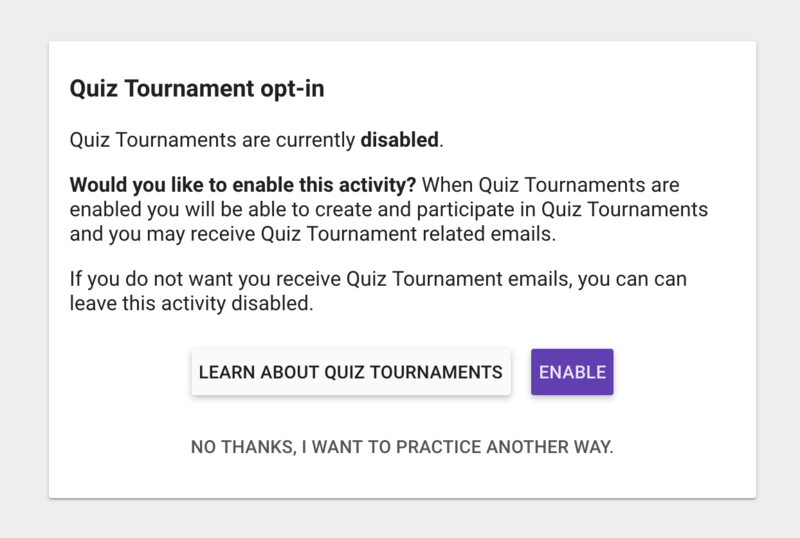 If you choose either of the first two methods, your opponent will be emailed an invitation asking if he or she wants to accept or decline the tournament. These will either be invitations that you sent that have been rejected, and you can select a new opponent, or invitations someone else has sent you. These are ongoing Quiz Tournaments or ones that you have completed or that have expired. Tournaments that you can play now with either have a “Start” button (if they are new) or a “Continue” button. Tournaments that are complete or for which you’re waiting for the next round to be unlocked, will have a “View” button. Expired tournaments are also shown. Tap on the button to go to any of these tournaments. To get started, select Quiz Tournaments, from the Select page (or just jump directly there). We hope you enjoy, and don’t forget to let us know what you think or report any problems. As mentioned above, this is the first version and we’re eager to hear what you think! What other categories would you like? What could we improve to make this more engaging?